We are excited to publicly announce two very special trips to Komodo National Park this coming July with the Underwater Tribe. We have reserved back to back sailings with the exclusive live aboard “Wellenreng” in the wonderful Komodo National Park, Indonesia. The dates for these two trips are 5 – 14 July and 15 – 24 July 2016. What makes these trips so special is that the boat hosts just 3 cabins, which means our group will have a maximum of only 6 guests! With such a small group we will be able to pick and choose the best sites at the best times to avoid the crowds and dive the sites at the most opportune times, rather than sticking to a set schedule like larger boats do. If we find a particular site is really hot for diving and photography, we will stay on the site all day if we want! The Wellenreng prides itself on fantastic personal service which is one of the reasons we have chosen to work with the vessel, combined with their intimate knowledge of the area and flexibility of schedule. Of course the Underwater Tribe also knows a lot about the Komodo area so we will personally discuss the diving plans each day with the crew to ensure we are at the right place at the right time. Mike or Luca will be on the boat to host and lead the trip; we will not be conducting a formal photo workshop, however we will certainly be on hand to help everyone with their photography needs and conduct evening presentations about underwater photography and Indonesia in general. July is a great time to dive the area with a very good chance of encountering mantas, turtles, and sharks. Komodo is home to some of the most varied diving that Indonesia has to offer with a huge range of eco systems to visit such as beautiful hard coral reefs, manta ray cleaning stations, action packed pinnacle dives, and amazing black sand muck dives as well. The sheer variety of dives in the Komodo area is a great attraction for underwater photographers who enjoy a mix of both wide angle and macro subjects and is one of the reasons we visit there every year. There is only one full cabin available for each of our two sailings so please get in contact with us ASAP if you would like to confirm your place on one of these very special trips. The cabin can be configured as either a twin or double so it’s perfect for either a couple or else two friends to share. 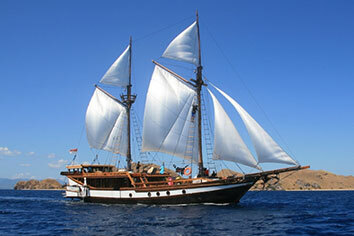 There is also the possibility to join us on back to back trips to spend almost one month of diving in Komodo! In addition to this trip we will be also running a special underwater photography warm up session in Bali. Arrival and Departure from Labuan Bajo ( Komodo). The trip costs 3800 Euro per person plus 200 Euro for Park/Harbour fees and 100 Euro for Nitrox. The boat will depart and return to Labuan Bajo for each trip, therefore, guests will need to arrive into Indonesia from Bali and then connect to Labuan Bajo via domestic flight (approximately $200 USD return) We recommend that guests arrive in Bali at least 1 day ahead of the domestic flight and plan their international departure one day after their domestic flight case of delays. 3-4 guided dives per day guided by an experienced Indonesian dive guide.